Social media has revolutionized communication. But, it has the potential to affect much more. Do these platforms help increase democracy? How can social media sites’ collection of user data impact society? And what can we do to protect our privacy? To explore these complex topics, the Steven J. 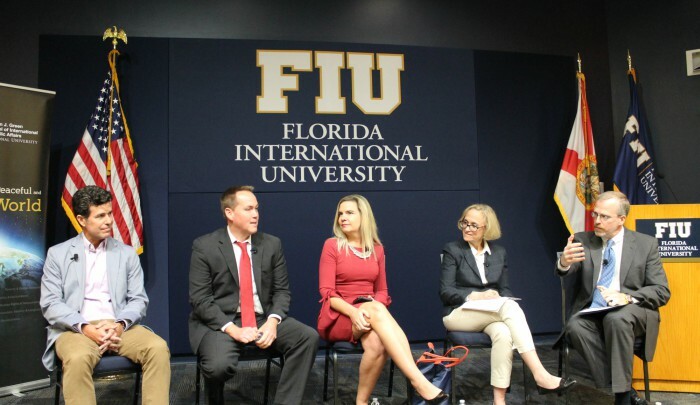 Green School of International and Public Affairs hosted a panel discussion with a star-studded group of experts: former deputy editorial page editor at The New York Times Carla Anne Robbins; Michael Samway, president of the Business and Human Rights Group; Brian Fonseca, the director of the Jack D. Gordon Institute for Public Policy at FIU’s Green School; and Nancy Richmond, who teaches marketing at the College of Business. The conversation was moderated by David J. Kramer, senior fellow in the Green School’s Vaclav Havel Program for Human Rights and Diplomacy. From left to right: Michael Samway, Brian Fonseca, Nancy Richmond, Carla Anne Robbins and David Kramer. The speakers discussed the controversy over Facebook’s breach of privacy – and how it may have influenced voter’s choice during the 2016 U.S. presidential elections. “Why did Facebook violate its own policy – that’s the bigger question?” said Robbins, currently the Marxe faculty director of the master of international affairs program and a clinical professor at Baruch College/CUNY’s Marxe School of Public and International Affairs. Samway said we inherently give up some of our privacy when we use Facebook. And we know it. Why do we do surrender our privacy? Because social networking sites like Facebook offer us instant and convenient connection to anyone in the world, he said. Each user must to decide if the trade-off is worth it. Panelists discussed how Facebook has already begun making efforts to increase privacy. Other options include passing legislation similar to Europe’s data protection act that help safeguard privacy. Social media sites and websites collect data from users. That’s no secret. But what do they use that data for? “Right now it’s used for marketing, but if used to shape cognition – to shape thinking – it becomes very dangerous,” said Fonseca. The experts said it’s possible that social media could be used as a tool to influence behavior based on data collected about users. Another way social media is used: to advance democracy. There are various examples of social media playing a positive role in helping cause democratic change in regions. But, Samway and Fonseca pointed out, totalitarian regimes can also use social media as a tool to send out its propaganda, to censor and to keep tabs on its people – hindering democracy. The fake news and misinformation swirling around on social media sites also bring up difficult questions. Can it be censured without infringing on our freedom of speech? Panelists discussed that part of the value of social media lies in allowing all people to voice their opinions and having the Internet offer a public record of history, without censoring. Panelists did emphasize that hate speech on these sites can and should be reported to the social media companies. Amidst questions and debates, one thing is clear: it is increasingly becoming the individual’s responsibility to find truth, Fonseca said. We need to cross-reference our sources, check facts, invest in strong civic education and be aware that we can opt-out of tools that invade privacy. We can also avoid getting addicted to networking sites. “Social media is like junk food,” said Richmond. It’s up to you how much you consume. To view the entire panel discussion, click here.